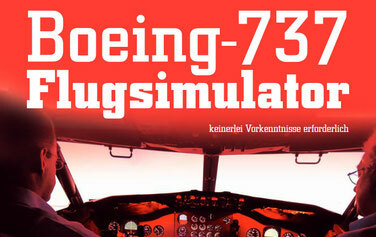 Fly a Boeing B-737 flight simulator at the Air Force Center Dübendorf. Since 1960 and up until today, the Boeing B-737 has been the standard aircraft used by many airlines and was built in several versions from the 737-100 to the 737-800. 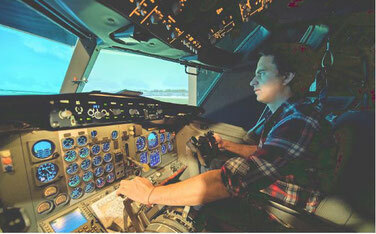 Operated in cooperation with Flight & Cockpit, the Boeing 737 Flight Simulator is based on an original United Airlines cockpit and includes complete instrumentation as well as an 180° out-the-window visual display. 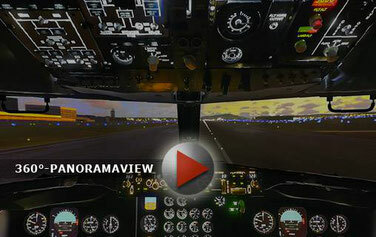 When sitting in the cockpit one can perform all operations as in a real airliner. Fly to your dream destination, either from Zurich via Sion to Geneva and back, or try making an IGS13 vector approach to Hong Kong Kai Tak International Airport – the no longer used legendary approach over Hong Kong City roofs! SELBSTVERSUCH: Der Journalist wollte herausfinden, wie anspruchsvoll es ist, eine grosse Passagiermaschine zu fliegen. Nach einigen «Flügen» gelang tatsächlich eine Solo-Landung mit minimaler Unterstützung.